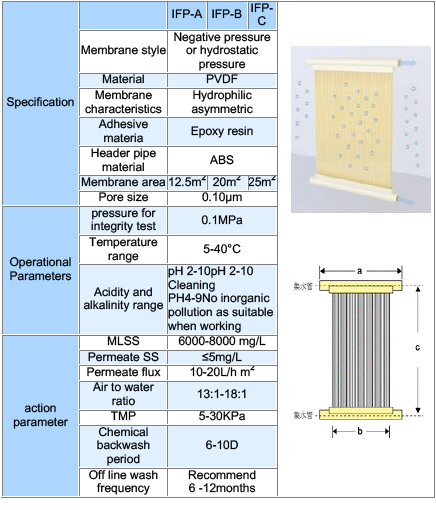 The flat plat membrane filtration of hollow fibre MF is a membrane separation process by pressure, it can separate the particulate matter from the dissolved component of liquid. There is highly efficient removal of colloid, silt, algae, cryptosporidium, giardiasis tyzzer, coliform, bacterium and majority virus, product water can be generated by negative pressure suction or by hydrostatic pressure. 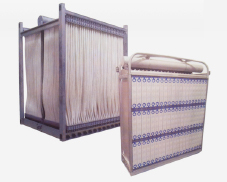 The FP modules produced by Innermem are designed to be used in MBR systems. According to the requirement of engineering design, membrane modules are assembled into membrane units, then they are divided into groups to be submerged into MBR tank and undertake the work of separating sewage from water. The main objective of this arrangement is to provide sufficient circulation space around the membrane modules. Sufficient space should be available around the modules to ensure good upward movement of liquor within the inner parts of the modules and downward movement of liquor outside the modules, optimizing the circulation flow within the tank. � The distance between the upper end of the membrane unit and the the surface of the water (low water) should not be less than 500mm. � The distance between the aeration pipes and the base of the membrane module should not be less than 180mm. � The distance between the aeration pipe work and the base of the aeration tank should be around 150-250 mm.